Monthly magazine "Food processing industry" devoted to questions of economics and engineering of food industry had been publishing for few years until July 1930. Organizers and curators of the first magazine were main directorial of agriculture food industry of Higher Board of National Economy of USSR, directorial of agriculture food industry of Higher Board of National Economy of RSFSR and Central committee of union of workers of food and taste industry, government economic associations of food processing industry. The magazine was intended to specialists of butter-making, tobacco, tea and coffee, alcohol and vodka, distilling, brewing, barn, canning, starch-treacly, macaroni and non-alcoholic branches. 1930 – first year of five-year plan – plan of technical reequipment and reorganization of industry, transport and agriculture, beginning of gigantic construction of firstlings of five-year plan. Food industry reequipped and reconstructed together with whole country. As a result of it there was taken the decision – instead of one magazine "Food industry" there will be several branch magazines, including the magazine "Canning industry" which later renamed to "Canning and fruit and vegetable industry". After 1940 branch magazines were combined into one again and from January to May 1941 there were 5 numbers of the magazine "Food industry". Acting editor-in-chief of the magazine "Food industry" was M. Lifshits. From June 1941 to December 1956 there was no publishing of the magazine. In January 1957 publishing of branch magazines of food industry was resumed, including the magazine "Canning and vegetable siccative industry". Renamed later to "Cunning, vegetable siccative and food concentrate industry" which existed till 1984. Editors-in-chief were: 1957-1963 – I.I. Adamovskiy, 1970-1971 – G.M. Evstigneev, 1972-1975 – M.V. Karapetyan (acting editor-in-chief), 1976-1984 – A.F. Namestnikov. In the end of 1984 the Department of food industry in concordance with Central Committee of the CPSU took the decision to organize new head magazine "Food and processing industry". Created on the basis of the magazine "Cunning and vegetable siccative industry" the magazine "Food industry" was in essence its successor. So 1930 was the year of formation of head magazine "Food industry". And in January 1985 there was published first number of the magazine "Food and processing industry". 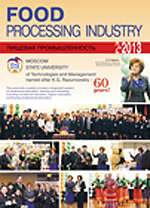 In three years it was renamed to the magazine "Food processing industry". Monthly theoretical and scientific-practice magazine "Food processing industry" was organized as organ of the Department of food industry of the USSR, the Department of meat and milk industry of the USSR, the Department of fish industry of the USSR, the Department of fruit and vegetable industry of the USSR and Central control of NTO of food industry. After reorganization of the industry the magazine became an organ of Government agrarian industrial committee of the USSR and the Department of fish industry of the USSR. The first publisher of the magazine "Food processing industry" was All-Union association "Agrarian industry publishing house". Nowadays the founder and publisher of the magazine "Food processing industry" is the limited company "Food industry publishing house". In all phases of the making and development of food industry of the country – from first five-year plans to Great Patriotic War and post-war restoration of national economy – the magazine perform its main task – it was organizer and propagandist of familiarization of the latest science and engineering achievements in food industry. The magazine was a connecting-link between scientists and practical workers of various food branches, between managers of all levels of control of food industry and specialists who worked on food enterprises of our country. At last years there were fundamental overpatchings in the sphere of economics. Reorganization and reforming of all national economy broke lots of economic ties. Agrarian and industrial complex of the country and including food industry got into the harder situation. Economical crisis, financial difficulties (absence of floating funds and capital investments), spike of equipment, energy supplies and other causes brought to serious decrease of manufacture of national foodstuffs. Also in such difficult conditions editorship of the magazine "Food processing industry" happen to work. Because of absence of financing decreased publishing, quantity of the staff, format of the magazine, regular numbers were delayed. But in spite of all hardship the magazine held out and was able to fundamentally transform both in shape and content. Large part in organization of effective work of the magazine was played by its editor-in-chief E.I. Lebedev who had been heading edition until 2004 and its editorship consisting of eminent scientists and specialists of food industry. On the pages of our magazine were published thousands of authors including workers of enterprises, scientists and specialists, managers and office workers, teaching staff and students. The magazine got favour among readers in many respects to its splendid author group. Apart there should be noticed our sponsors and advertisers who assist in publishing of the magazine in quality color appearance and on high level of polygraphy. Collective of the editorship of the magazine "Food processing industry" expresses our appreciation and gratitude to all authors, advertisers, sponsors and of course readers and congratulates all this our common holiday, the 75 anniversary of the magazine "Food processing industry".